Brompton Cemetery was opened in 1840 as the West of London and Westminster Cemetery. Its founder was the architect, inventor and entrepreneur Stephen Geary (1797-1854), who had previously created cemeteries at Highgate and Nunhead. These three, along with Abney Park, Kensal Green, Tower Hamlets and West Norwood, represent London’s Magnificent Seven, a ring of suburban garden cemeteries opened between 1833 and 1841, on the cusp of the Georgian and the Victorian eras. The population of London had doubled within 40 years; with some two million inhabitants, it was the largest city in the world. New burial space was needed to meet the demands of a rapidly growing city and relieve the horrors of crowded ancient churchyards. The Magnificent Seven were commercial ‘joint stock’ enterprises, raising funds through the sale of shares on the stock market, and aiming for a clientele from the affluent middle and upper classes. Facilities for the general population followed from the 1850s, as the metropolitan boroughs began to establish their own municipal cemeteries. Brompton’s original 39 acres, purchased from Lord Kensington in 1838, lay on a flat stretch of land, half a mile long, between Old Brompton and Fulham Roads. When the site was chosen, the Kensington Canal formed the western boundary, but this picturesque feature had been replaced by a railway by the time the cemetery opened in 1840. In 1843, John Gunter, a director of the company and later its largest shareholder, passed on a spur of land he had purchased from the Equitable Gas Company, thus providing the site with an entrance on Fulham Road. The directors of the cemetery company held an open competition for the design of its principal buildings, judged by a ‘Committee of Taste’ led by the distinguished architect Sir Jeffry Wyatville (1766–1840), William IV’s ‘Surveyor of the Fabric’. He chose a design submitted by one of his assistants, Benjamin Baud (c.1807-1875), who had worked with him at Windsor Castle, thus rejecting Stephen Geary’s own proposals and forcing him to resign from the board of directors. Baud’s winning design was strongly reminiscent of Wyatville’s own work, and this engagement proved to be the master’s last major architectural involvement, for he died four months before the cemetery opened. The site had been rendered featureless as a brickworks and market garden, but Baud’s design cleverly employed its linear character to create an immense open-air cathedral with a central ‘nave’ (Central Avenue) running 2000 feet (600m) to a spectacular ‘high altar’ (the domed Chapel), through the 300-foot (92m) Great Circle, said to have been inspired by the piazza of St. Peter’s in Rome. The Cemetery planting was completed in 1846, and the Minute Books record that there was once a double avenue of limes flanked by pines lining the central drive, a feature which appears on the Ordnance Survey maps of 1865 and 1895. The limes remain, and have indeed been dated by tree-ring analysis to 1838, but the pines have long since disappeared. The imposing North Gatehouse on Old Brompton Road, built to look like a triumphal arch, represents the ‘great west door’, while the symmetrical layout of the smaller paths creates two pairs of ‘aisles’ running parallel to the central ‘nave’. The North Gatehouse was refurbished in 1856, the front refaced Aislaby Stone. It suffered extensive bomb damage during World War II and was subsequently restored. Two prominent colonnades flank Central Avenue and the Great Circle, with catacombs beneath, entered by impressive cast-iron doors. The original plan called for ‘transepts’ on either side, formed by dedicated chapels for Roman Catholics and Dissenters, but a combination of financial constraint and social prejudice predicated against both. The proposed site of the Nonconformists’ chapel still remains unconsecrated in consideration of their religious convictions. After an unsuccessful attempt to purchase a plot to the west of the Great Circle to build their own chapel, an independent group of Roman Catholics eventually secured a site adjacent to Kensal Green Cemetery, and established the Roman Catholic Cemetery of St. Mary’s, subsequently exhuming several monks from Brompton for reburial there. Thus, the present chapel was initially reserved for the Church of England, but later rededicated for Nonconformist use. A catacomb with a promenade above it originally ran the entire length of the west wall, balanced by a raised earthen terrace along the east wall. The promenade had been designed to exploit the view of the Kensington Canal and rural landscape beyond, but large sections were later taken down, as a railway succeeded the canal and suburbs began to cover the fields. The directors, determined that their cemetery would overcome the limitations of its site through landscaping and architecture, pushed ahead with Baud’s grandiose scheme, despite growing concern on the part of some shareholders. The project was proving vastly more expensive than envisaged:from an estimate of £30,000 for the whole job, £61,000 had been spent by 1841, with the work not yet complete. Building was still in progress when the Bishop of London, Charles James Blomfield (1786-1857) , consecrated the cemetery in June 1840. As an interim measure, part of the northeast lodge was converted into a temporary chapel: the first burial took place later that month, on 18 June 1840. However, business was slow and the builder, Philip Nowell, had to advance the cemetery company large sums to continue working. The management also began to notice structural defects, for which Nowell the builder and Baud the architect blamed one another. The directors owed so much to Nowell that they took his side: Baud was dismissed, and later sued the Company, unsuccessfully (as had Geary in his turn). Although the major shareholders supported the grand plan, many small shareholders wanted a faster return on their investment, not least as a severe economic depression gripped the country in the early 1840s. Before the Companies Act of 1848, votes were allocated per member rather than per share, so the small shareholders in their numbers represented substantial opposition. Some uncertainty then arose over Lord Kensington’s entitlement to have sold the site, which he appeared already to have transferred in a marriage settlement; the matter was only resolved through litigation, which lasted until 1854. Meanwhile, the Metropolitan Interments Act of 1850 prohibited burial in congested urban churchyards and crypts, and gave the state powers of compulsory purchase over commercial cemeteries such as Brompton. The Act was repealed by the 1852 Metropolitan Burials Act, but not before an official offer had been made for the cemetery. The government wished to withdraw, but the smaller shareholders insisted that the sale be completed, although they were subsequently disappointed by a settlement of £75,000 (a fraction of the £169,000 they had claimed in compensation). Thus Brompton Cemetery became the only private cemetery purchased under the 1850 Act, and also the first ever to be nationalised. It is still Britain’s only crown cemetery, held for the last 65 years in the care of the Royal Parks Agency. Brompton Cemetery’s burial archive, contained in 140 leather-bound registers, has been transcribed into a computer database. Original cemetery records, including the original cemetery company’s Minute Books, are held in the Public Record Office at Kew. 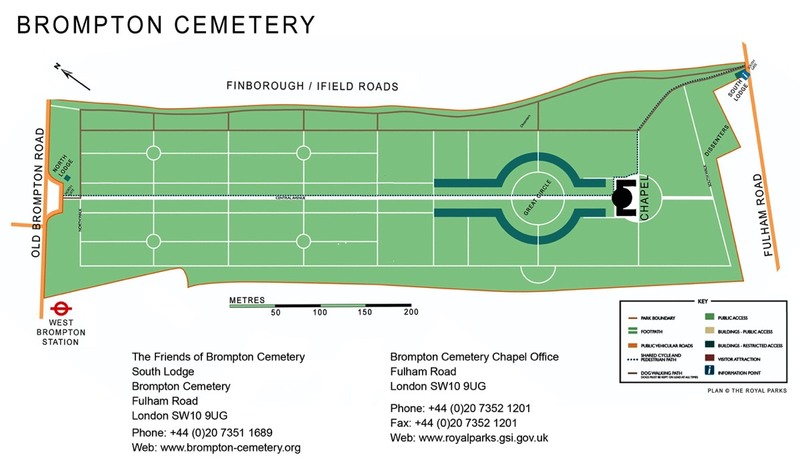 From 1854 until 1939, Brompton also became the London District’s Military Cemetery, after the churchyard used by the London Garrison (belonging to St. John’s, Smith Square) was closed by the Metropolitan Interments Act. Because the War Ministry paid reduced fees, servicemen were often buried in unmarked common graves. However, the Royal Hospital Chelsea purchased its own plot near the north west corner, and both the Household Cavalry and the Brigade of Guards laid claim to sections due south of that. There were some 155,000 interments by 1900, but little more than 50,000 followed before the cemetery was closed to new burials in 1952. For some forty years thereafter, Brompton Cemetery received interments only in established family and military graves. It was opened again to new burials in 1996, with provision for single and family burials (typically now leased for a period of 75 to 100 years), and the deposit of cremated remains (on leases from 30 to 75 years or more). For grave searches use the online database https://www.royalparks.org.uk/parks/brompton-cemetery/search-burial-and-cremation-records or contact the Cemetery offices on 020 7352 1201 (+44 20 7352 1201 from outside the UK). Brompton Cemetery is now a Grade I Listed site in the national Register of Historic Parks and Gardens. The Chapel, the colonnades, and the gate and screens on Old Brompton Road are all Grade II* Listed, while the gates and screen on Fulham Road at Grade II Listed. The Chelsea Pensioners’ Monument, the Guards’ Memorial and 27 individual monuments are Grade II and one, the chest tomb of the ship builder and art patron Frederick Leyland by Edward Burne-Jones, is Grade II*. To complete the set, two vintage K2 telephone kiosks just outside the cemetery gates are also Grade II Listed.